In January 1982, Ronald Reagan invited a 28-year-old American named Lenny Skutnik to attend his State of the Union address. Several weeks earlier, Air Florida Flight 90 had crashed taking off from Washington National Airport, and Skutnik had plunged into the ice-bound Potomac River to rescue a woman who’d lost her grip on the helicopter line. In his speech, Reagan regaled members of Congress with the tale of the young government employee’s gallantry. Skutnik, he said, represented “the spirit of American heroism at its finest.” As audience members stood to applaud the bashful honoree, a new rhetorical gimmick was consecrated. Last week’s address to a joint session of Congress saw Donald Trump working his own dark voodoo on the tradition of trotting out everyday citizens to score political points. Thirty-five years after Reagan celebrated a man who’d saved a fellow American’s life, Trump populated the House gallery with the family members of murder victims—specifically Susan and Jenna Oliver and Jessica Davis, the relatives of three men killed by undocumented immigrants. Lenny Skutnik, portrayed as a selfless swashbuckler, epitomized the best of America. He stood for what Reagan and his audience dreamed the nation could be. This year’s Skutniks seemed designed to scare us rather than inspire us. They portended the American wasteland that awaits if we choose not to follow Donald Trump’s lead. Or at least some of them did. 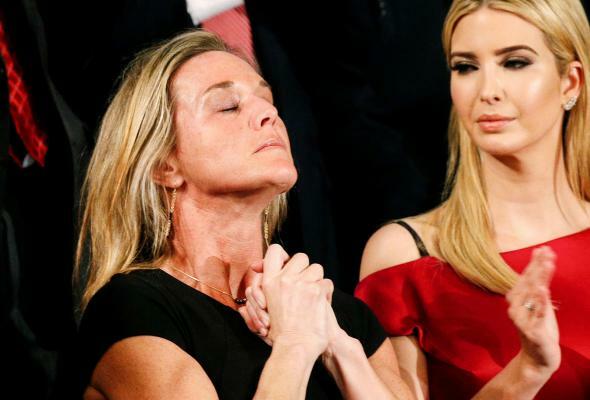 Trump’s second Skutnik—the widow of Navy SEAL William “Ryan” Owens, who died during a botched operation in Yemen—felt like a more conventional State of the Union guest. In celebrating Owens’ life and death, Trump tapped into the tradition of his office, the deep ceremonial lore that instructs U.S. presidents to thank fallen troops on behalf of the nation, like a genius loci accepting the blood offering that will renew the land. Trump did his best to absorb Ryan Owens’ valor, if not responsibility for the operation that killed him. Carryn Owens, for her part, embodied the role of the steadfast wife enduring her husband’s ultimate sacrifice. What she has in common with Susan and Jenna Oliver and Jessica Davis is bereavement. Trump’s exploitation of heartbreak follows a familiar script. Priam paused the Trojan War to weep over Hector’s body alongside Achilles. The Montagues and Capulets put aside their feud in deference to their slain children. In ancient times and in our politically fraught epoch, the profound resonance of familial sorrow feels like the one pure thing that carries enough emotional weight to overcome the other side’s intransigence. Who can argue with the tears of a grieving widow? The Khans followed in the footsteps of Cindy Sheehan, who camped out for months in front of George W. Bush’s ranch in Crawford, Texas, protesting the death of her son in Iraq. Newtown families toured the country advocating for gun control. The Mothers of the Movement—seven women of color who had lost children to police violence—elevated the cause of Black Lives Matter (and recorded a commercial for Hillary Clinton). Now, the Olivers and Jessica Davis—victims of so-called “immigrant crime”—have given voice to a right-wing talking point. Deploying the grief-stricken, with their unimpeachable moral authority, is the kind of political maneuver that either transcends politics or cheapens the discourse, depending on your point of view. When she asked, of Clinton, “How could she do this to me? How could she do this to any American family?” Smith made the abstract business of government chillingly real. Likewise, in his convention speech, Khizr Khan convinced viewers that the country’s values and spirit were on trial. “He is a black soul,” Khan later said of Trump. Had an aspirant for office spoken those words, he or she’d be mocked or ignored. But Khan, a parent rather than a politician, could access a more dramatic, intimate, and even metaphysical register. To challenge him, as Trump did, felt cold-hearted and inhumane. What unnerves us seems to be the sense that emotion, not reason, is moving those rooks around the board. When rational analysis fails, appeals to pity and our shared helplessness in the face of mortality might yet land. As much as we don’t want to feel strong-armed into a political stance, we also can’t bear the thought that others—especially those across the aisle—might prove more sensitive, compassionate, or virtuous than we are. Even critiques of these tragic figures wrap themselves in superior moral sentiment: If you’re not a monster for disagreeing with the crying wife, you’re a monster for acquiescing to her debasement. These disconsolate men and women typically connect themselves to specific policy aims. The Mothers of the Movement want criminal justice reform and more oversight of police departments. Cindy Sheehan desired an end to the Iraq war. Patricia Smith pushed for an investigation into Benghazi. Khan preached acceptance and compassion for Muslim Americans. But what, exactly, did Trump hope to accomplish by illuminating Carryn Owens’ sorrow? Not a particular policy objective. Instead, as Phillip Carter argues, he siphoned off the woman’s fortitude for himself. This Skutnik functioned as a human shield. “Well, she likes me,” Trump seemed to boast, as though Owens were another of his very famous and impressive friends.